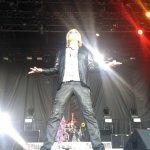 Def Leppard played a show at the Stampede Roundup 2013 in Calgary, Canada last night and setlist details are available. The band played a 15 song set in a show that took place on an outdoor stage on a bill with Cheap Trick and Sloan. The show started in bright evening sunshine with both Joe and Vivian wearing sunglasses on stage. Joe later joined in with Cowboy theme of the event and wore a cowboy hat during the encore (as many of the crowd did through the entire show). 7 songs were played from the 'Hysteria' album with 'Gods Of War' left out again. 'BOTH' and 'Switch 625' returned to the set. The show once again included the two encore tracks 'Rock Of Ages' and 'Photograph'. The next show takes place on 13th July in Quebec City, QC, CANADA. Played for the first time in Canada. Played in Calgary for the first time since the 24th August 2005 show. Both played for the first time since the Santiago de Compostela show in Spain.